Looking for some great Tulsa Banners? Banners are our expertise. We have many styles and options to choose from that will fit exactly what you are trying to achieve. Tulsa Banners are used for many different occasions. Because they aren’t going to break the bank you can use them for ANY occasion. They can be used for businesses to promote their brand, logo, special promotion or sale. They can be used at parties like: homecoming, going away parties, birthday parties, graduation parties or any time you have something to celebrate. They are effective at trade shows, show rooms, outdoor street signs, the possibilities are endless. An effective banner will be one that your clients or guests remember. We can help you find what that looks like or if you have an idea for us, then bring it on in. We have had some great ideas by our clients and we were thrilled to be able to help them get exactly what they were looking for. Even if you don’t have a finished design, we can help you design it to make the banner more effective. We serve Tulsa, Broken Arrow, Bixby, Jenks, Sapulpa, & Sand Springs. We are so thrilled to go through our neighborhood and see our banners hanging on businesses, homes, churches and so many more locations. Quality Signs & Banners will always be everything we can to make you a satisfied customer who will want to come back again and again. 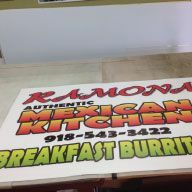 If you are looking for the best banner printer in the Tulsa then come by, or just call us today at (918) 251-2100!